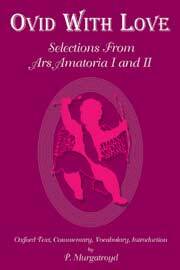 This book contains 770 lines from Ars Amatoria, Books I and II, a full introduction on Ovid's life, 148 pages of vocabulary, and commentary that offers insights on Ovid's stylistic choices. The notes provide a wealth of information on Roman customs, mythology, history, and literary tradition. Ovid with Love by P. Murgatroyd is an aptly named selection of 770 lines from Ars Amatoria 1 and 2 and with its 23 page introduction on Ovid’s life, Augustan and pre-Augustan love poetry, 148 pages of commentary and complete vocabulary, it is a potentially useful sixth-form reader. The importance of stylistic and metrical features in Ovid’s writing has led the author to comment fully on them over the first 92 lines and then, progressively, to leave it to the pupils to make their own investigation; notes on comprehension, and these always precede those on literary criticism, are detailed throughout; indeed at times one feels that there is overkill: e.g., 2, 431 (OCT) nam modo Threicio Borea, modo currimus Euro; on ‘Threicio’ the note reads: Thrace was a cold wintry region to the North of Greece, and so in Greece the chill North Wind was often called “Thracian” and described as having its home in Thrace (because it came from that direction).’ However, as Murgatroyd points out, he has tried to bridge a number of levels in this edition and the notes, which are set separately at the end of the text, need be no more obtrusive than individually desired. There are advantages in being able to sample from two books of the Ars when the selection is as carefully made as this one and in criticizing the fullness of some notes one ought not to forget the plight of the weaker student. This book makes a nice introduction to Latin poetry for students coming from Latin grammar.... But irritation with the first half of the Introduction (10 pages) melts before the satifisfactions of the Commentary (160 pages). Before I turn to it, let me add that the sections on scansion and on metrical and stylistic effects in the second half of the Introduction are clear and effective. Alliteration, chiasmus, anaphora, rhythmic effects, and all their brethren are described and provided with examples. The Commentary consistently points out such devices in the text, so any attentive student should begin consciously to enjoy Ovid’s style. M. knows what students will fumble over when first reading poetry. He assumes thorough knowledge of grammatical forms but provides extensive help with syntax. For instance, for the clause arte regendus Amor (1.4), he supplies est but does not say what form regendus is. The vocabulary does not include oblique forms (e.g., nactae, 1. 54, must be found under nanciscor). M. seldom translates a difficult line; he gives the students all the help they need too work it out for themselves. Beyond these virtues, the notes also provide a wealth of information about Roman customs, mythological and historical allusions, literary references (especially Ovid’s parody of didactic poetry). M. points out the humor in various descriptions, the point of comparisons, puns, and ambiguities. In specific contexts, he notes Ovid’s psychological insight. He does splendidly what he had hoped to do: he makes the text come alive. The selections seem well-chosen, adding up to 770 lines of text. The Introduction and Commentary are photocopied from typescript but are easy to read. The Bibliography is brief and general. The book would be fun to read with a class. I do recommend that any teacher who uses it counteract the influence of the word ‘trivial’ and, more important, have a thorough class discussion of Ovid’s use (sometimes ironic use) of sexist stereotypes!